Haven Holidays is the largest provider of domestic holidays with family holiday parks around the UK, priding themselves on having smart modern sites with attractive landscaping in safe, secure surroundings. So when Haven needed a new pool complex, their architects HTA specified that contractors Entech use a specially formulated and visually attractive resin bound aggregate surface to cover 280 square metres of the pool complex. Resin Bound Surfacing is anti slip (essential around pool sides) and in keeping with Haven Holidays commitment to the highest standards of health and safety.The system also meets the demands of the SUDS sustainable urban drainage regulations. 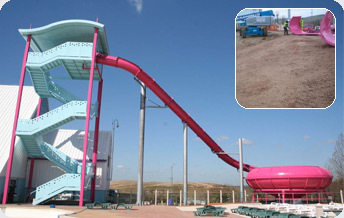 The high standard of workmanship and satisfaction of the system they had chosen for the splash pool resulted in Bourne Leisure asking the contractors to lay a further 800 square metres to complete the sun deck. 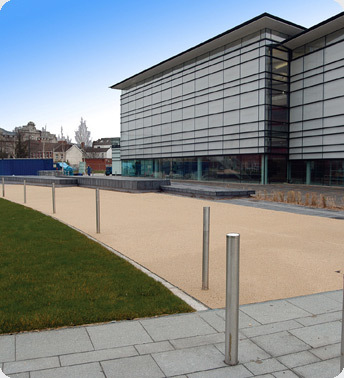 Resin Bonded Surfacing has been laid onto external pathways and communal areas within the landscaped gardens and grounds of the National Waterfront Museum in Swansea. The museum, which opened in the summer of 2005, tells the story of Wales’ industrial and maritime heritage.The building and landscaping features over 7,000 m2 of interconnecting external pathways. The pathways needed to be slip resistant in all weathers with an attractive surface that complemented the overall design. Resin Bonded Surfacing is a hardwearing, natural surfacing system that offers excellent slip resistance. It is also strong enough to take the museum’s regular vehicular service traffic.Resin Bonded Scratch Coat was applied to regulate the surface of the substrate, before application of Resin Bonded Surfacing Buff Resin. Chinese Bauxite aggregate was immediately cast into the rapid curing resin, to ensure full penetration into the resin and left to cure for two hours. After being swept, the paths were ready for immediate use.Resin Bonded Surfacing is a slip-resistant, durable, fast curing surfacing available in a variety of colours. 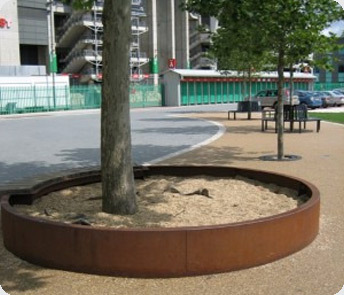 It has been successfully used for a wide variety of paving applications including the walkways from car park to the terminal at Stansted Airport, highways, concourses, footbridges, pathways, driveways, car parks, balconies and terraces, boardwalks, jetties, ramps and steps. Twickenham Stadium was recently enlarged to seat 82,000 making it the second largest UK stadium, second only to Wembley. The tarmac paving outside the stadium was renewed and paths and walkways were applied on top of the new tarmac.The Resin Bound Surfacing System was applied at a thickness of 15mm by to create decorative, slip resistant pavements for the sports, music and other fans who use the stadium’s facilities every week.Resin Bound Surfacing System was supplied in easy to use packaging comprising a two-component polyurethane resin together with aggregates for easy on-site mixing in a forced action mixer. The two component non-yellowing resin was mixed with a drill and paddle mixer and added to the dry aggregate, mixed and then laid onto the prepared surface.Within just four hours the new surface was ready for the feet of the and of their many fans. Importantly it satisfies the SuDS regulations allowing rainwater to quickly and easily drain through the permeable surface, is slip resistant and is quick and easy to lay.